Chevrolet will pace its 19th NASCAR Sprint Cup Series race at Indianapolis Motor Speedway on Sunday, July 28, when ESPN “SportsCenter” anchor and Indiana University graduate Sage Steele will drive the designated 2013 Camaro ZL1 Pace Car during the (*breathes*) Crown Royal Presents the Samuel Deeds 400 at the Brickyard Powered by BigMachineRecords.com. Phew. 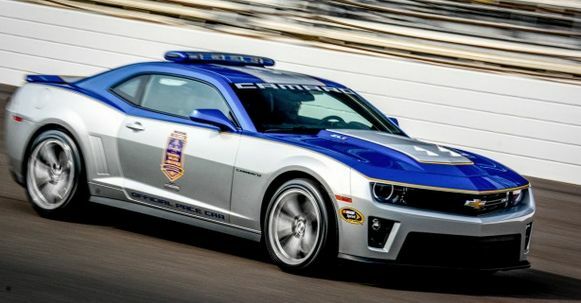 This year’s Brickyard 400 will also mark the sixth time a Camaro has paced the race. They should have used the new Z-28. what is the name of that blue?